The BayArena played host to Bayer Leverkusen vs Gladbach as the home side dominated proceedings. 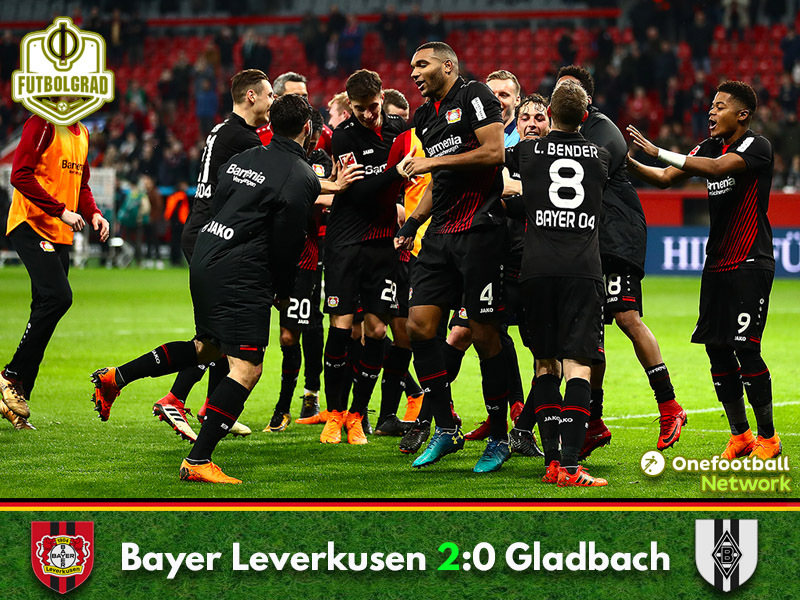 Out passing and out shooting their opponents Die Werkself eventually overcame a Gladbach side that once again only showed quality in short bursts. Gladbach made the one hour trip east to local rivals Bayer Leverkusen in search of a win, die Folenelf were hoping to put their European ambitions back on track after dropping two points on Matchday 25 against Werder Bremen. Conversely, Bayer were aiming to push Dortmund into fourth, keeping touch with second placed Schalke. As the half started it was the hosts who hit the ground running. Full of energy, and buoyed by their recent win against Wolfsburg, they confidently attacked their vistors. Lars Bender drawing the first save of the match on five minutes. The centre back brought down Julian Baumgartlinger’s header and unleashed his shot from the edge of the area – Yann Sommer was down quickly to save well on his left side. Leon Bailey began to show why he is currently one of the hottest young properties this season, dancing down the wing he setup Kai Havertz, but the young German was only able to find the centre of the goal and with it a grateful Sommer – the Gladbach ‘keeper already earning his wages as the clock hit 11 minutes. Watching his brother try his luck in front of goal, the other Bender wasn’t to be out done – Sven going close before Charles Aránguiz worried the away side with a free kick that wasn’t too far away from the top corner. 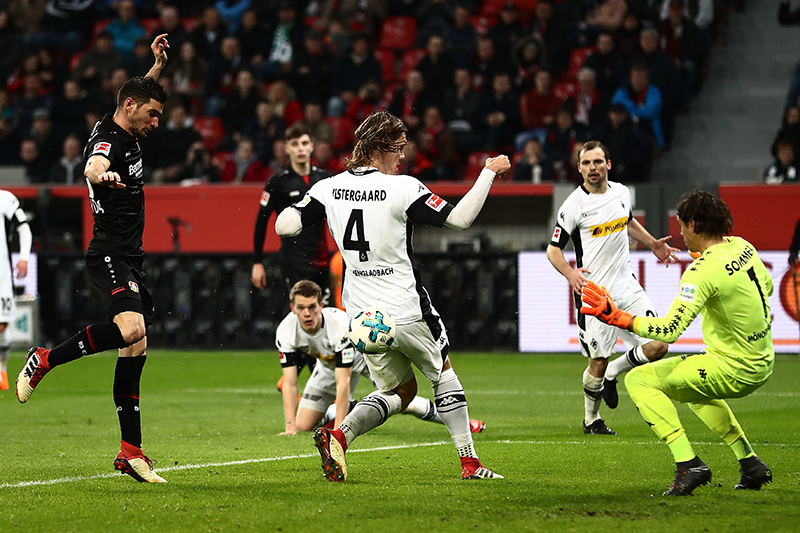 With just over five minutes remaining of the half, Lucas Alario eventually found the net for the Werkself. Latching on to Kevin Volland’s header the Argentine blasted in from close range. As the side’s left the pitch for half time the score was reflective of the control Bayer had exerted. In their last game, Gladbach let a two-nil first half lead slip to throw away two points – something Dieter Hecking would have been keen to remind his players of – a repeat which they could illafford this time out. A display not that dissimilar of late was to follow from Gladbach, poor for 70 minutes, excellent for 20. Denis Zakaria began to propel die Folenelf forward, the Swiss defensive midfielder the heart of the Gladbach engine that suddenly cured its misfire. Michaël Cuisance was brought on by Hecking with 20 minutes remaining and it changed the game for his side. Gladbach went from timid to torment, pushing their hosts back to the edge of their own area at times – had the French teenager started this game the result could have been very different. As the clock ticked towards the 90 minute mark Gladbach created one chance of real quality – Josip Drmic should have done much better with his header but the centre forward could only look on in despair as his chance crept wide. Just as Gladbach were midway through throwing the kitchen sink at Leverkusen the hosts killed game. Julian Brandt’s right footed shot found the bottom left corner of the goal as the game went into added time. With a goal and an assist the Argentine produced a solid display – scoring in back-to-back Bundesliga games for the first time in his career his play of late is living up to expectation. Unafraid to drop deep and help create space his quick thinking almost resulted in a more reflective scoreline for the hosts as the second half progressed. However, it was to be his left footed shot from close range and an added time assist to Julian Brandt that would define the fixture. Gladbach once again are unable to match part of their their play with a goal. Captain, Lars Stindl is now 21 hours without a goal and this is atypical of a side that has only managed nine goals in three months of football. Goals win games and Gladbach have a real problem of late finding the net when they most desperately need it.